Can patient planning be more efficient? The Computational Intelligence and Multiagent Games (SEN4) research group at CWI uses software agents and smart, adaptive algorithms to improve hospital patient scheduling and to better match patients appointments to their own preferences. The aging populations in the western world are placing an increasing demand on health-care services, and the provision of efficient yet high-quality care is a prime concern for providers. Key health-care providers like hospitals want to provide their patients with high levels of service, such as short waiting times and the ability to make appointments that fit the needs of individual patients. At the same time, the scarce hospital resources should be used with the highest possible efficiency, in order to keep health care affordable. As is known from both theory and practice, low access time to resources usually comes at the expense of resource capacity. The premise of our work is to combine improvements in logistics with smart, adaptive IT approaches. This can give lower access times by using more flexible resource allocation, while maintaining and possibly even increasing effective resource usage. Parts of a resource calendar are typically allocated to different patient groups. These allocations must be flexible to make efficient use of the resource. Efficient scheduling of patient appointments on expensive resources is a complex and dynamic task. Traditional approaches to logistical improvement are usually not suited to the medical domain. In most hospitals, the internally distributed authority makes it difficult to implement efficient scheduling between many departments. This can partly be explained by different operating procedures for different medical disciplines, and partly by the existing professional culture. Furthermore, scheduling decisions must be made dependent on the individual patient's specific attributes, such as the level of urgency. In cooperation with the Academic Medical Center, a large university hospital in Amsterdam, we analysed and modelled the distributed patient scheduling problem. From these models and discussions with experts, we are deriving approaches to improve the scheduling flexibility and efficiency for bottleneck resources, while respecting the typical organization style of hospitals and medical constraints. We find that most bottleneck resources in hospitals are shared by several patient groups, where each patient group has its own distinct properties. For example, there are various groups of inpatients (admitted to the hospital) and outpatients (not admitted), with different levels of urgency. The total resource capacity is allocated to these groups, explicitly or implicitly (see figure). Due to fluctuations in demand, this allocation must be flexible in order to make efficient use of the resources. To complicate matters further, many outpatients must be scheduled for more than one diagnostic test. The outpatient department has to make appointments for these tests with the various auxiliary departments. A combination of tests might for instance be an imaging technique  like CT, MRI or echo  with an additional test (function/endoscopic/ punction). Each of the departments involved wants to fit the appointment into their own local schedule. At the same time, the outpatient department wants to schedule the combination of appointments within a limited time and to provide its patients with a high level of service by coordinating the various appointments, scheduling them, for example, in the same part of the day. Currently, coordination between departments to schedule combined appointments is too labour intensive and too dependent on the restricted time available to the operator. 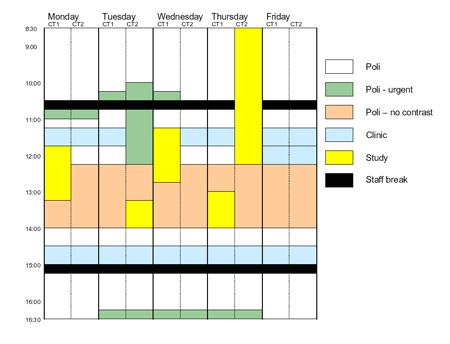 From our case study, the labour-intensive nature of scheduling is obvious, even though electronic calendar-systems are widely applied to allocate hospital resources. In general, these systems just store patient appointments, while as in many hospitals, the actual patient scheduling is done manually by human schedulers. They either check the calendar for an available slot, or use the search function of the calendar system to find available timeslots. To improve on this highly constrained scheduling practice, we have developed an agent system where each party - like doctors, patients and resources - is represented by a software entity - the agent - that autonomously acts on behalf of its owner. Given the distributed and decentralized nature of hospital patient scheduling, the use of such a distributed mechanism for scheduling seems a natural fit. Each agent knows the preferences and constraints of its owner. To increase efficiency while reconciling patients potentially conflicting preferences, we developed a Multi-agent Pareto Appointment EXchanging algorithm (MPAEX). In MPAEX, agents acting on behalf of individual patients attempt to exchange the time-slots of the initial appointments with better appointments occupied by other patients. The other patient's agent accepts a proposed exchange of appointments if the resulting schedule is not worse for that patient. Guaranteeing not worse for schedule changes means that patients have an incentive to cooperate, which is an important requirement in practice. In simulations, we show that when (re)scheduling patients using MPAEX, the collective overall waiting time for patients is improved. Furthermore we have developed an adaptive approach to automatically optimize resource calendars. Our approach makes the allocation of capacity to different patient groups flexible and adaptive to the current and expected future situation. To maintain high performance levels, our system regularly exchanges capacity between different patient groups. Additionally, opening hours for resources can be altered to achieve high capacity usage, while maintaining key performance goals such as waiting time. In our current work, therefore, we are focusing on improving the scheduling of combination appointments for hospital patients. Most importantly, we aim to improve the service provided to patients by facilitating same-day appointments and by taking the patients preferences into account, all the while using resources with a high level of efficiency.